Those not familar with Hellraiser or the parent series may be a little lost. Stood in the depths of the labyrinth Kirsty Cotton recalls the tale of a time not long after joining Levianthan’s ranks, where she was summoned to New Orleans by Lemarchand’s puzzle box. A tale involving a bitter blood feud between families and a warning about where good intentions lead. The rich world of Clive Barker‘s Hellraiser was previously the basis for a series of critically acclaimed comics from Epic Publishing featuring the likes of Neil Gaiman and Alex Ross amongst others in the early 90s. In 2011 a new series started with BOOM! Studios with Clive Barker as co-writer, which despite the franchises longevity was only the third time Barker was directly involved in the world of Hellraiser. This series would be set in the ‘canon’ world established in the original novel/film. Seeking revenge after his last defeat, Pinhead manipulated Kirsty Cotton, longtime adversary of the Cenobites, into taking his place in Hell. Hoping to save her friends and family, Kirsty sacrificed herself and took over the role inhabited by Captain Elliot Spencer. With Spencer now mortal and returned to Earth, Kirsty now reigns in Hell as the Cenobites’ new Priestess. The Road Below is spun off from this series. The story is split between the present in the depths of Hell and the past in New Orleans as Kirsty relates her tale to the cenobite known only as The Female (which fans of the original film will recognise). 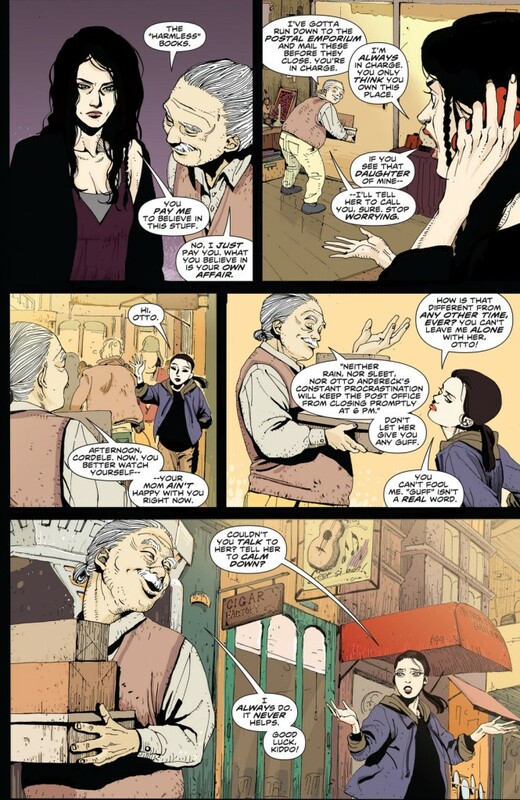 In New Orleans the story centres around Rhea Wolfe who works in an antiquities/occult shop along with its owner Otto her teenage daughter Cordelle and the mysterious Neithercoat. The relationship between Rhea and her rebellious daughter is well written and shows Seifert has a good handle on making characters feel like real people, which is fundamental for the story to have any real impact. When Cordelle shows up at the shop she gets a lecture about not being able to get job and is told to not touch anything. Cordelle promptly goes in the back and announces ‘touching things’. This leads into a neat red herring as Cordelle is shown getting ever closer to the Lemarchand puzzle box which is sat on a shelf alongside numerous other items. Rhea’s relationship with her daughter is just one facet of the story though and an encounter with the monstrous looking Neithercoate is another important relationship. Rhea’s family the Wolfes have a bloody history with the Neithercoates and neither family is entirely human either. Startled that her long buried past has found her and after narrowly surviving an encounter whilst visiting the grave of her husband, Rhea summons Kirsty with the Lemarchand puzzle box and attempts somewhat amateurishly to bind her to her will. Neithercoate explains ‘your kind are dreams come true….while mine are living nightmares’ to a scared Cordelle and this is as far as explaining exactly what the Wolfes and Neithercoates are but rather than it being a problem it works and works well. The demonic looking Neithercoate is a great character and his encounter in the graveyard establishes who he is clearly and memorably. Shrugging off a severed arm and quickly regenerating it, also establishes he has considerable power. 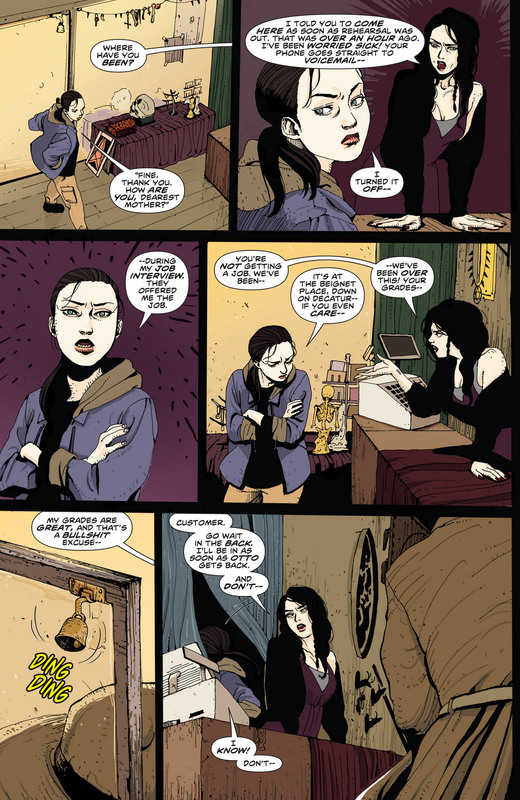 Kirsty Cotton is also an interesting character, the way she reacts to her summoning and her apparent binding with a bemused ‘What is it you want- the usual Faustian nonsense?’ is an amusing touch. The perspective of The Female is an interesting counterpoint to Kirsty as she relates the tale in Hell too, with her rather coldy pointing out ‘You should have discarded the body. The transgressors soul was enough’. Seifert’s fertile imagination is equalled by Haemi Jang’s art which is impressive throughout, with several fight sequences both magical and physical being clear, propulsive and absorbing . Rhea’s stint in Hell is particularly disturbing as she finds herself trapped in a vast mortuary with row upon row of steel mortuary trays stretching out infinitely all hosting her daughter Cordelle’s lifeless body in a different state of mutilation. Kirsty Cotton’s design, one of white robes and white scarves is a distinct contrast to the black leather and chains that immediately come to mind for Hellraiser and yet it works perfectly and also reflects Kirty’s different mind set to the other cenobites. The Road Below’s biggest strength is the ambiguity which flows through it all and the subversion of tropes like the demonic Neithercoate, who becomes a far more sympathetic character when his story is revealed. Intelligent horror is a rare thing more so in the medium of comics and BOOM! Studios delivers in style here.